It was a beautiful morning and we just had to be out in it. 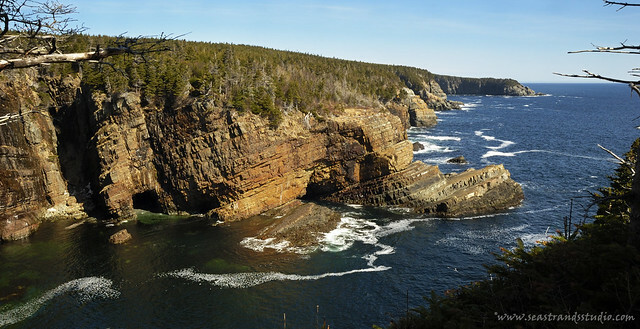 We weren’t sure where precisely to go and then I remembered that a new-ish geocache had been published on my favourite sections of the East Coast Trail, the portion between Stiles Cove and Red Head. 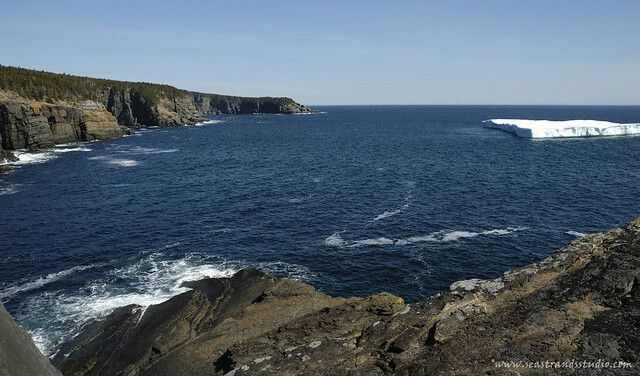 Since Stiles Cove is quite tucked away, it boded well to approach it in the morning, when the sun would fully illuminate it.Time being somewhat limited due to other obligations, it fit the bill as a beautiful, but relatively short, walk. So off we went, GPS and camera packed up complete with spare batteries for both. No first aid kit, though (that’s foreshadowing). We parked at Satellite Road and took the access trail in. 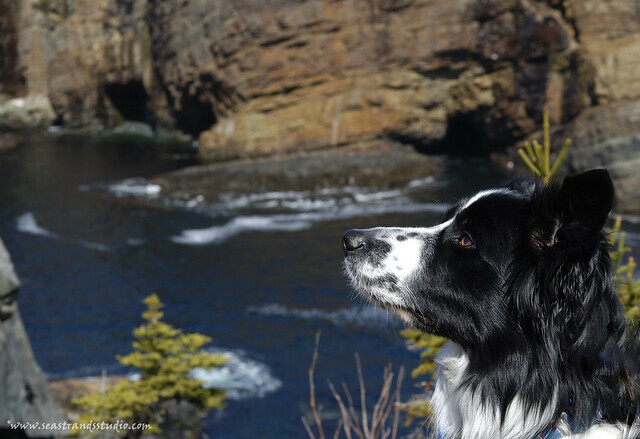 When we got to the ECT, we decided to take a left and head out to a lookout point from which you can look back at Stiles Cove for a better view. 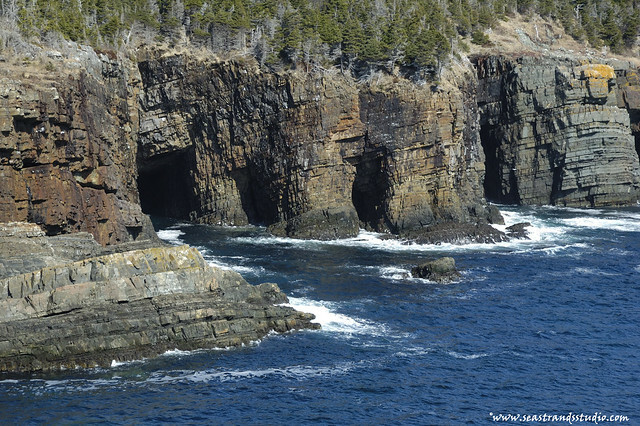 Stiles Cove. The waterfall is Half Moon Brook. There used to be an iron ladder that allowed folks to access and use the beach, but it fell into disrepair and became quite dangerous, so the army engineers blew it up one year. We were awfully glad we did! Katherine liked that this one had its own swimming pool (the birds are Black-Backed Gulls). 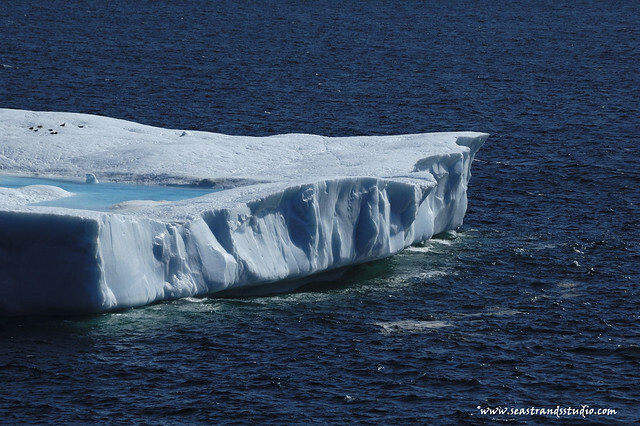 Berg with seagull swimming pool. 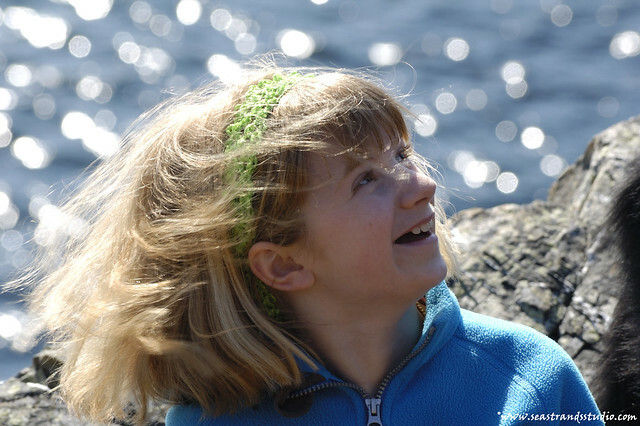 There was happiness and sparkling water and sunshine. We even stopped to check on a geocache we’d found before (One Sweet World), owned by our friends Gilligan & MaryJane, and it was in fine shape. I rehid it and pushed out of the overgrowth. Then I put a tree into my leg. Someone had cut off a tree (possibly in winter) and left a stump that reached to just above my knee. I didn’t even see it, but turned and walked through some overgrowth and whammed into it. My immediate reaction was to clamp a hand over it hard and twist to sit/fall down. This resulted in pulling some other muscles in both legs. Once I could bring myself to pull my hand off, I spotted the hole in my thigh. Let’s just say that it was messy and inordinately painful and that I will henceforth be carrying a good first aid kit and a hiking stick on all future day hikes. I managed to stabilize things enough to hobble 200 metres across the bridge and on to the other geocache, where I got to sit and take pictures. We probably should have packed it in right there, but it was an absolutely perfect day and I figured that a bit of a sit-down would make the walk out easier. So we walked very slowly and got to the sitting place. There was a snack, which afforded good Rowan pictures (she always poses nicely during snack time). 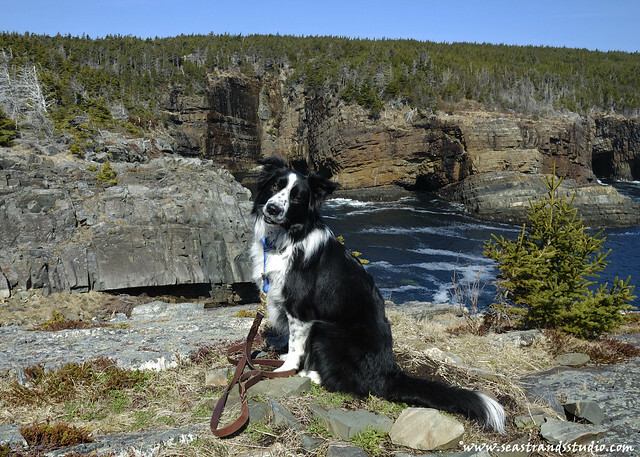 Rowan practices her "sit-stay" at Stiles Cove. There were sea caves and they were almost enough to make me forget about my leg. Except for my leg, it was a perfect day. There was even ice cream, which I think *might* have taken some of the sting out of the disinfectant when I got home. Looking north along the coast. 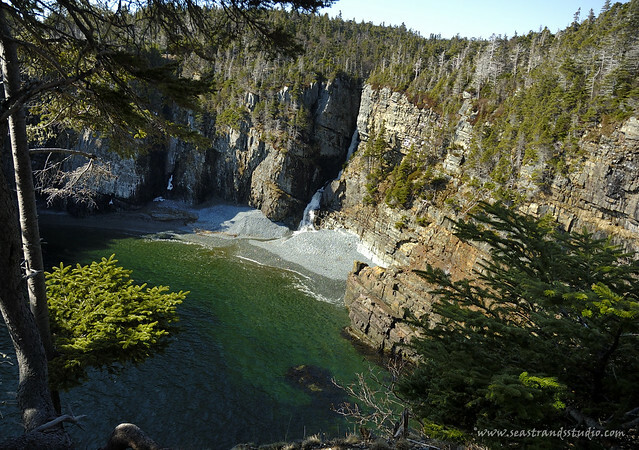 Both myself and Kayla also really enjoyn the Stile Cove area. We had considered trying to get some of our wedding pictures taken there but figured it might have been to difficult to access in a wedding dress. Thanks for checking on our cache and giving us a shout out! Hope the leg injury does set you back for too long! 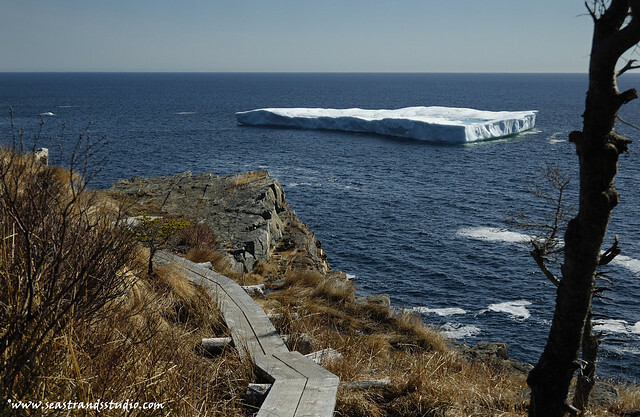 Great pictures of Stiles Cove. Make sure to save your blog. It could become a book!